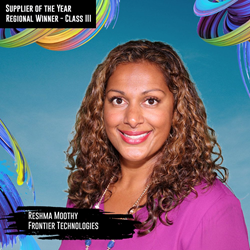 Pictured: Reshma Moorthy, President of Frontier Technologies - Class III Supplier of the Year Regional Winner. "We wouldn’t be here without organizations like the NSMDC or the community of diverse suppliers we’re privileged to be a part of." Frontier Technologies was nominated and recognized for the National Minority Supplier Development Council’s (NMSDC) Class III Supplier of the Year Award at the Annual Conference in Austin Texas, October 14-17. Frontier recently won the Class III Supplier of the Year Award from their regional council, the Eastern Minority Supplier Development Council (EMSDC), so the national honor is quite momentous for their continuous success. Additionally, Reshma Moorthy, President of Frontier Technologies, recently received the Minority Business Enterprise Advocate of the Year Award from the EMSDC for her devotion to the council, and her service as Chair of the Minority Business Enterprise Input Committee, giving a voice to minority-owned businesses. Frontier has been involved with and served the supplier diversity community for decades, mentoring new diverse suppliers, leading and serving on committees in councils and organizations, and winning awards for that service. Frontier Technologies, Inc. designs and delivers award-winning IT solutions to help our clients innovate, differentiate and disrupt. For more than 30 years we've grown Frontier by helping clients build data centers and IT infrastructure that power their businesses. Our decades of experience and focus on the future means clients can store, serve, analyze and maintain their data across platforms, software, networks, and the cloud - in ways that set their business apart. Our cybersecurity-first approach means our clients' data is safeguarded end-to-end and at every step - protecting and fueling their competitive edge. We do this by matching our more than 12,000 certified minority-owned businesses to our vast network of corporate members who wish to purchase their products, services, and solutions. Our corporate membership includes many of the largest public and privately-owned companies, as well as healthcare companies, colleges, and universities.